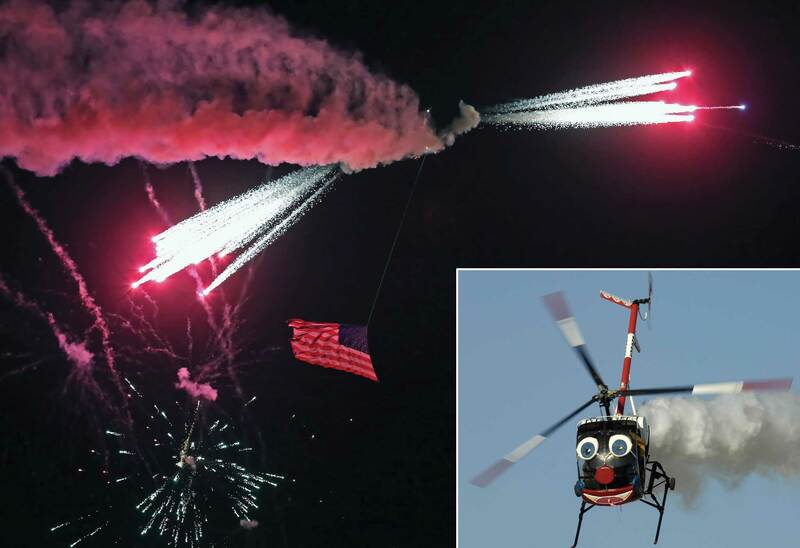 Otto has been an airshow mainstay for 25 years, and in recent years has added night shows with crowd-pleasing pyrotechnics. If you’ve frequented major American airshows in the last 25 years, chances are you’ve seen Otto The Helicopter, a 1985 Schweizer 300 with its canopy done over in clown face. Roger Buis is Otto’s second pilot; he and his wife Pauline bought the act in 1999. Buis has a pocket full of helicopter and fixed-wing ratings, an A&P certificate and more than 18,500 hours total time, 12,000 of it in helicopters. He and Pauline are the recipients of the 2013 Art Scholl Memorial Showmanship Award from the International Council of Airshows (ICAS). When not traveling the airshow circuit with Otto, he is chief pilot for Pensacola, Fla.-based Heliworks, flying diverse missions from offshore transport and charter to movie filming and news gathering, power and pipeline patrol, firefighting and flight instruction. During its daytime performance, Otto bobs up and down parallel to the crowd line, treating spectators to a series of quick vertical ascents and drops, tight pedal turns, steep banks, and lateral and backwards flight. The announcer “asks” Otto a question, and the helicopter “shakes its head” yes or no, much to the delight of everyone, particularly small children. At night, Otto takes on a different persona. Buis started flying a night show with Otto about nine years ago, inspired by the late Eric Beard, a fellow airshow performer who flew a Yak-54. “He had one of the hottest night shows around. Eric would walk out of the [annual] ICAS convention with 10 or 15 shows in his pocket, while we’d walk out with one or two and then have to work the telephone afterwards like mad to fill up our schedule. The only thing different was that he was doing night shows and he was really good at it,” Buis said. “When you have a unique aircraft it is hard to get booked at shows because people don’t understand it. They just know they need variety. So they will hire a helicopter act, but they won’t hire two of them. It has been very, very few times that I’ve actually been at an airshow with Chuck [Aaron, the Red Bull MBB BO105 pilot], but he does a full-blown aerobatic routine and people like to see that–and Chuck is free. Red Bull pays for that. So it is really challenging to get booked,” he explained. Buis knew that he had to kick it up a notch to stay in the game. And that meant a night show with lots of pyrotechnics. “I’ve got more than 3,000 night hours and 1,000 hours flying with night-vision goggles. Flying at night is not a scary thing for me at all,” Buis said. While he had the experience, the number of variables in planning a night show can be overwhelming. Buis, assisted by Bob Carlton, who flies a night routine with a jet-powered sailplane, built pyrotechnic racks for Otto. The challenge for Buis was building a show that stayed within budget, provided good entertainment value and skirted any potential requirement for licenses from the U.S. Bureau of Alcohol, Tobacco and Firearms (ATF). The answer was 1.4 pyro, the same rating used in football stadiums and indoor rock concerts. Buis also “didn’t want to start any fires,” noting that sometimes more powerful pyro can fall off aircraft and burn for a while after hitting the ground. Rather, the idea was to use the helicopter’s natural ability to fly low and slow with smoke illuminated by the pyro to create an effect similar to “a fiery comet going across the sky. Even though we are flying lower, at 500 feet, the smaller pyro looks big,” compared to night airplane acts that fly at 1,000 feet and need the more powerful 1.3 pyro to captivate crowds. Buis experimented with various combinations for a year before flying his first night show. “Some of the pyro I use now is the same type that Disneyland uses,” he noted. The experiments paid off. Buis’s bookings are up, and today 60 percent of the shows Buis flies are night shows. “If they are going to hire you for the night show, they are going to hire you for the day show, too,” he noted happily. Buis controls the pyro with a circuit box that straps onto his knee, connected to wires outside Otto that are secured with tie wraps. “I select whichever circuit I want and hit the fire button. Each channel controls a sequence of effects–sometimes as many as 200–that lasts for at least 30 seconds. Once I hit that button, I’m committed. Thirty seconds can be a long time if things are not right.” Fortunately, for Buis, “not right” hasn’t happened yet. “People sometimes ask how I light off the pyro and I just tell them I fly with a big old stogie cigar in my mouth,” Buis laughs. Rigging Otto for each night performance takes at least 10 hours. Buis pre-loads the racks so he can do a day and night show on the same day; however, even when pre-loaded, attaching the racks to Otto takes 90 minutes. Loading and unloading the racks is a painstaking process. He strips the paper wrapping off each charge and replaces it with aluminum tape to reduce the danger of fire before placing it in the racks. After each performance, it takes another two hours to strip and clean the racks. More than 700 explosive events take place during Otto’s 10-minute night show, 40 percent in the last minute, choreographed with the flying of a giant American flag that Otto tows with a 175-foot line, illuminated by two powerful ground lights. Buis also reverses the landing light to enable it to shine on the trailing smoke.